During week 19, seasonal influenza A (H1), A (H3), and B viruses continue to co-circulate with novel influenza A (H1N1). Approximately 73% of all influenza viruses being reported to CDC are novel influenza A (H1N1) viruses. The increase in the percentage of specimens testing positive for influenza by WHO and NREVSS collaborating laboratories may be due in part to changes in testing practices by healthcare providers, triaging of specimens by public health laboratories, an increase in the number of specimens collected from outbreaks, and other factors. **one case is resident of KY but currently hospitalized in GA. This table will be updated daily Monday-Friday at around 11 AM ET. NOTE: Because of daily reporting deadlines, the state totals reported by CDC may not always be consistent with those reported by state health departments. If there is a discrepancy between these two counts, data from the state health departments should be used as the most accurate number. 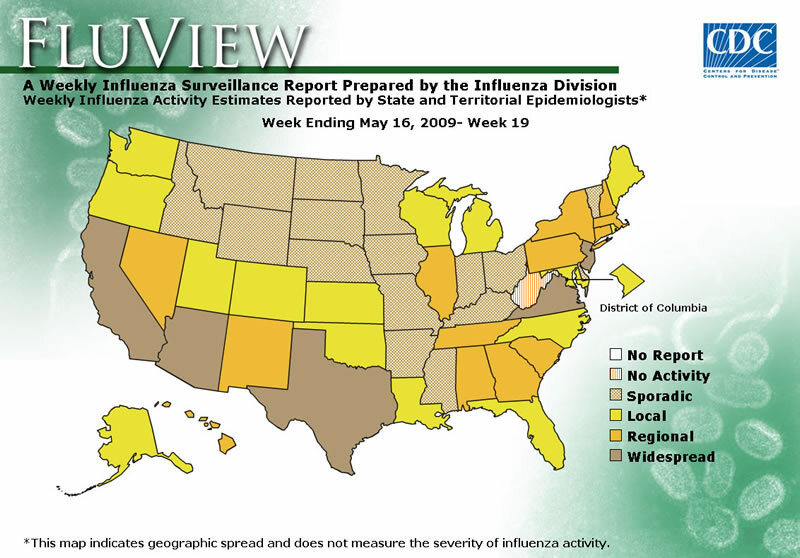 For more details about the data in the map above, see the FluView Surveillance Report for the week ending May 9, 2009. 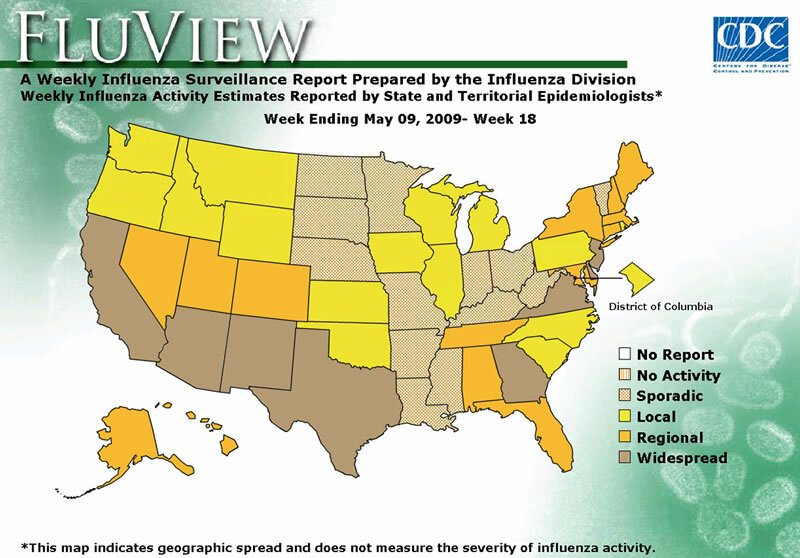 During week 18 (May 3 – 9, 2009), influenza activity remained at approximately the same level as last week in the United States, indicating that there are higher levels of influenza-like illness than is normal for this time of year. One thousand four hundred fifty-four (11.9%) specimens tested by U.S. World Health Organization (WHO) and National Respiratory and Enteric Virus Surveillance System (NREVSS) collaborating laboratories and reported to CDC/Influenza Division were positive for influenza. The proportion of outpatient visits for influenza-like illness (ILI) was above the national baseline. Three of the ten surveillance regions reported ILI above their region-specific baselines. Eight states reported geographically widespread influenza activity, 14 states reported regional activity, the District of Columbia and 15 states reported local influenza activity; and 13 states reported sporadic influenza activity.